This birthday greeting is going in the mail this morning to a little girl who loves purple. Happy Birthday, Jennifer! I'm out to work in my flower beds this morning pulling weeds and thinning sprouts. Lenny saved some of our wedding flowers as he calls them. When we married, we had a garden theme and gave packets of zinnia seeds as favors. We planted ours and they return year after year. Since he has been doing heavy mulching, it takes longer for the seeds to find their way up. Just as a precaution, he saved some of the dried bloom last year and I planted the seeds where I really wanted them to appear in a new bed. It worked, plus many from last year came up in our old beds. This weekend I'm making several cards. I need "Thank You's" in my stash. The past few days I've been finishing up his birthday party invitations. Also I've been obsessed with working out my next quilting pattern. More about that in another post. Happy Friday! Stamps: Dots and Punches and a Little Birdie Told Me (greeting) by Stampin' Up! 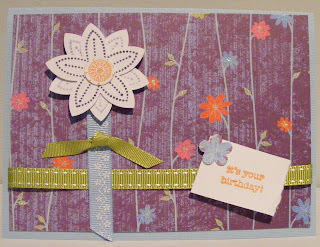 Inks: Elegant Eggplant, Lovely Lilac and Only Orange by Stampin' Up!